The silly season is nearly upon us and we are starting to make plans for the long drive home for Christmas. At this stage we will be returning to the 'Rock' for possibly up to 6 months next year, then we will go to Vietnam for 5, maybe 6 weeks around June/July and then possibly head south to SA and Vic to do the 'Great Ocean Road' and up the NSW coast back to QLD before heading off again. The trip home this year will be a bit rushed as we have only given ourselves a week to drive home, get the caravan packed up and head for the Sunshine Coast for the holidays. We will need a holiday after that!! It has been yet another great month out here in the middle of the desert. We continue to do 'Sunset' out at the Rock at least once a week, a view you could never tire of. Socially things have hotted up significantly, with a number of social activities keeping us on the go. Last weekend we were actually out 3 nights in a row. Now that is overdoing it a bit. Of late we have had the most unusual weather. 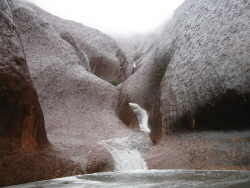 It has been raining almost every few days for the past 4 weeks, and at times has been rather cold. The days in between are hot and clear, some days being 40 C and over. You don't come out here and expect to see so much rain, and we're told this is not the usual weather pattern. Of course with rain comes one of the most sought after views in Australia, and one that very few get to experience and enjoy. 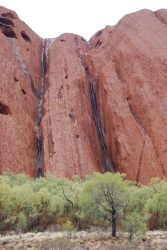 Of course I refer to water running off Ayers Rock. In fact as I sit here writing this, Chris is out at the Rock again taking a few more photos of this, for most, a once in a life time opportunity. A couple of weekends ago we had a huge down pour, so we headed straight out to the Rock to see it first hand. It was funny as there was hardly a tourist to be seen, but plenty of staff and residents, all out there for the same reason. 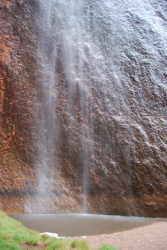 It was an amazing view, and although the waterfalls were flowing, we would still like to see it with the water really cascading over it. Maybe one day. The sound of the frogs in these ponds is now deafening. Enough of the weather. For those regular readers you may remember while we were living at Kings Canyon I mentioned that a lot of 'Priscilla Queen of the Desert' was filmed there. 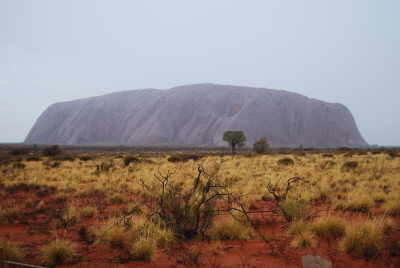 Well we have discovered that the rest was filmed at and around Uluru. The other day we were down at the oval for touch footy and there on the oval was the actual big pink shoe that was on top of the bus in the movie. The shoe had been donated to the resort when the filming was finished. Well the next most exciting thing to happen was with 'Evil Kinevil', alias Alex and his new riding tricks. All was going well, and in fact I was expecting phone calls from the producers of Mad Max and Indianna Jones, requesting Alex for their next production, WHEN......... the inevitable mega stack occurred. Did he break an arm or leg, a huge laceration requiring 50 stitches, NO, of course not. Instead he snapped off half of one of his front teeth. Why couldn't it be a cheap old broken arm. Do you have any idea what this is going to cost us to get it fixed? We will be accepting donations and will be opening up a bank account to receive all your generosity!!!! The dentist will be having a jolly old Christmas this year when he is finished with us. going to a lot of trouble and expense for the evening. As you can see from the photos I went to a lot of trouble getting my costume fine tuned. My outfit certainly was the one to beat. The night was a lot of fun but bloody freezing. It was held under a huge marque on the oval and the cold coming up through the grass almost made it painfully unpleasant. But we battled on regardless and spent the evening chatting to all and sundry. This is a strictly 'Resort Resident' only affair. 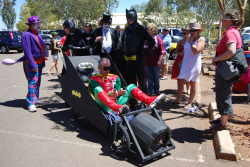 Then it was up again early for the beginning of the billy cart bash. There were only six carts this year, with a circuit about 2 kms long. There is a lot of cheating, bribing and corruption. The Firies shot them with water, the police pulled them over and demanded money (all going to a good charity of course) and the teams are made to do revolting things along the way. The kids line the road and throw water bombs, flour bombs and anything else they can get there hands on. If by some chance we are still around next year (most most unlikely), I will definitely be putting in a Health Clinic cart. 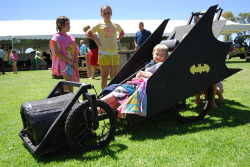 Following the race is a fete with stalls, food and entertainment for the kids. We had a good day doing a bit of our Christmas shopping and I even managed to get myself a nice Billabong jacket, that looks very trendy for $2.00. Chris picked up a few pairs of pants for $2.00 each. We certainly are big spenders. 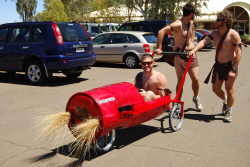 The next social event around good old Yulara was the 'Starmaker' talent evening. Now here is the picture. You put an act together and get up on stage and make a complete fool of yourself. Sounds fun, but I can do that without getting on stage!!! 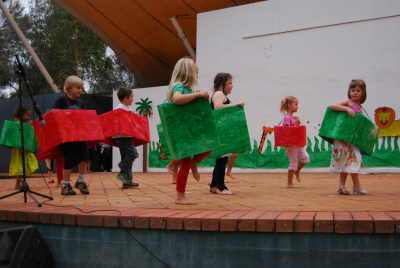 Each class at school did a performance which was of course fantastic. I worked behind the bar with Murph and George (that is one of George's snakes draped over Murph and me) while Chris ran around getting the kids ready for their performance. Harry was great standing at the front of the stage doing his thing. Alex the show pony was also excellent with his class winning 1st Prize. It was a simple but fun evening and we are now really starting to know lots and lots of people so these outings are even more fun. So that pretty much is November. 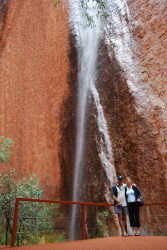 We leave here on the 4th December and start the 3,500 km trip back to Bundy. 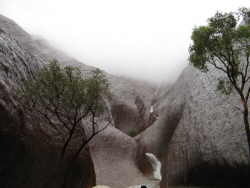 The trip was going to be much shorter until recently when we had some huge storm cells go through here and Alice Springs. 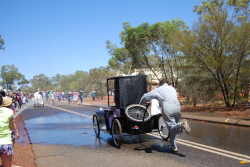 Other than a lot of local damage the Plenty Highway (which is nearly all dirt) flooded and was closed. Bugger. It re-opened within a few days but the general feeling is that the damage will make travelling on it unpleasant at best, down right dangerous at worst. Probably not worth the risk as we are on a time line. So now we have to decide whether to go north to the 3 ways and across or south to Port Augusta, up to Broken Hill and across to home. We think at this stage we will go up as it seems psychologically the shorter way to go. We will be back in QLD until late January and then head West and do the 3500kms all over again. Is it really worth it I hear you mumble, absolutely, every single inch of it. For those readers that we won't see and to those that we don't even know, the Parfitts hope you have a great Christmas. Have a great time and we hope the big fat fella in the red suit finds you whereever you may be. We hope that the New Year brings everything that you wish for, and if it doesn't, you will just have to make it happen. Until next month. This month I am going to break from tradition and finish with some actual quotes from American Courts, that have been written down word by word. Here are some very good reasons why we as Australians should not follow in the American way, but stand proud as Australians, and do things our way.